On this page I am highlighting a number of champions and future champions currently being exhibited in Sweden, Finland and other European countries. In the UK Adam now has champions here in Australia with more Best in Group & In Show winning minis nearing their championship titles. 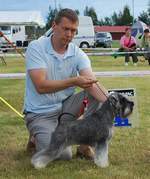 To Adam's and Regency Kennels credit Adam is a Best in Show and Runner-up Best in Show All Breeds winner and Best Miniature Schnauzer in Show at Queensland Specialty Show. Adam has sired many International, Dutch, English, Estonian, Finnish, Lithuanian, Swedish and now Australian Champions. 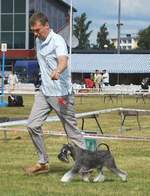 Here is Terttu showing off her natural beauty with a gorgeous reach of neck and super short back correct head and beautifully balanced typical mini schnauzer puppy. 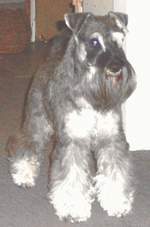 Luke as a very young puppy but showing promise here with a lovely neck and shoulder placement, correctly banded pepper and salt coat with Adam's lovely head and expression, a true schnauzer representative. Here is another outstanding Adam son called "Cheantake Bass & Rythm" aka Otto winning Best of Breed and CACIB in Finland and well on his way to his title. 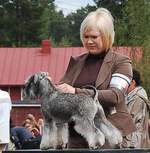 This young dog also exhibits Adam's handsome traits such as a long strong neck and shoulder placement with typical schnauzer carriage. He exhibits an excellent pepper and salt correctly banded coat. Now Finish Ch Cheantake Best n'Style aka Luke. Shadow.....Mirror mirror on the wall who is the most handsome of all?